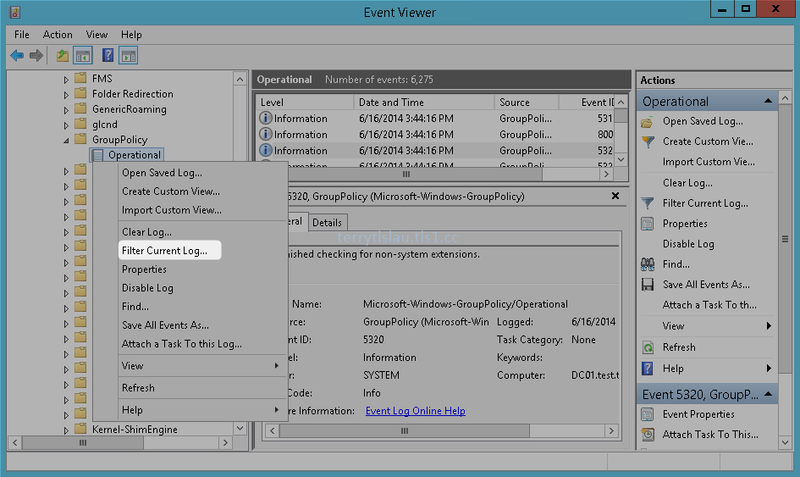 Jeremy Moskowitz, an MVP of Group Policy, showed a demonstration to create a custom view in Event Viewer to trace Group Policy processing of domain group policy objects for a specific user or computer in Teched North America 2014. 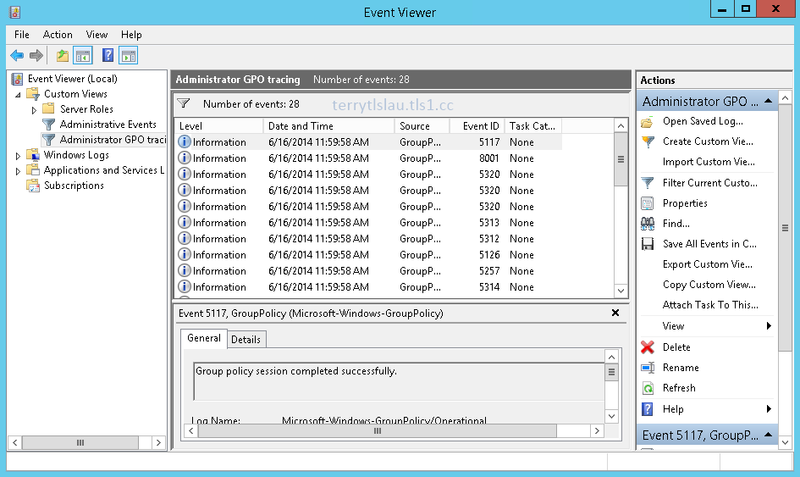 By default, events are under "Microsoft-Windows-GroupPolicy/Operational" saved all events related to group policy processing for all users and a computer account. It is difficult to trace Group Policy processing for a specific user or computer. To easily trace Group Policy processing for a specific user or computer, administrators have to find the "Activity ID" of a user or computer. To locate a suitable "Activity ID", we need to understand the behavior of "Activity ID". 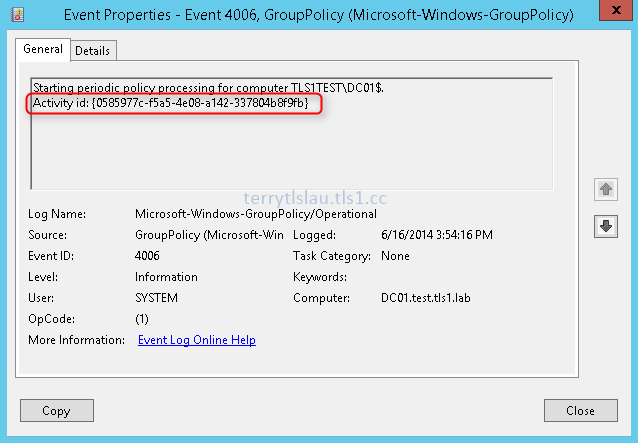 When a user logs in or a computer updates group policy periodically, a user or a computer will generate a new "Activity ID". administrators should locate an "Activity ID" for troubleshooting. Locate "Activity ID" of a user or a computer. 3. 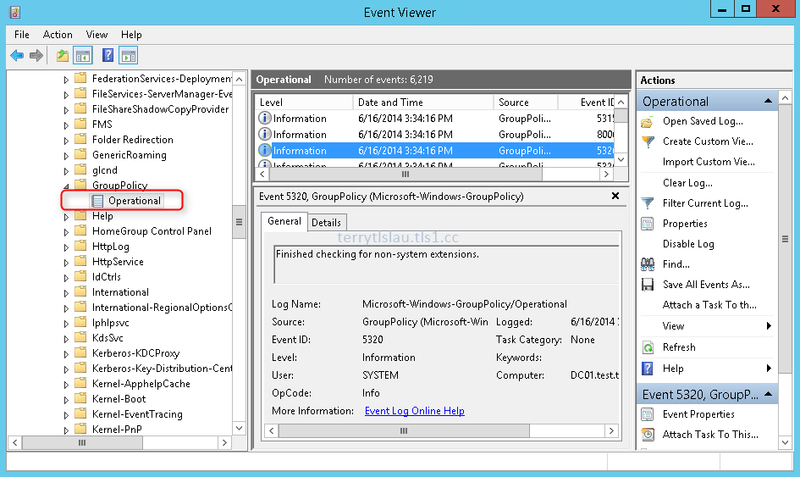 Navigate to "Applications and Services Logs > Microsoft > Windows > GroupPolicy > Operational". 4. Right-click "Operational", select "Filter Current Log". 5. 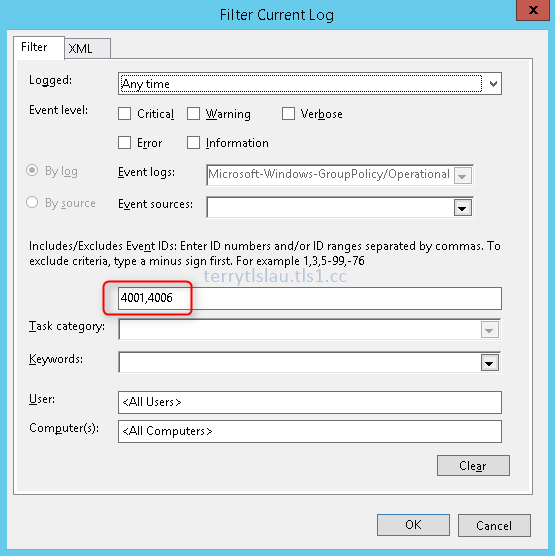 On "Filter Current Log" window, next to "<All event IDs>", enter "4001", "4006". 7. Select "Event ID 4001". We can locate an "Activity id" of administrator. The "Activity id" will changed when the same user log on the same computer again. We should select the latest one to troubleshoot the group policy processing. Event ID 4001 is used to locate an "Activity id" of user accounts. 9. Select "Event ID 4006". Event ID 4006 is used to locate an "Activity id" of a computer account. "Activity id" will change when a computer update group policy objects. We should select the latest one to troubleshoot the group policy processing. 11. Copy the "Activity id" of administrator to a notepad. 12. Navigate and then right-click "Custom Views", select "Create Custom View". 13. On "Create Custom View", select "XML" tab. 14. Check "Edit query manually". 15. Click "Yes" to manually edit the query. 16. 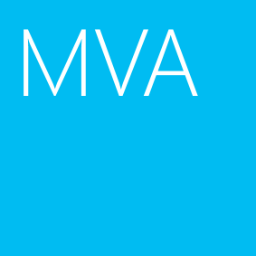 Microsoft provided the following XML code for us to paste it in this pane. 17. Copy the above code and then paste it into the XML pane. 18. Replace "INSERT ACTIVITY id HERE" to the "Activity ID" from a notepad. 20. 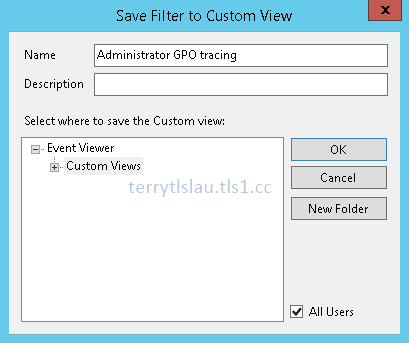 On "Save Filter to Custom View" window, next to "Name", enter "Administrator GPO tracing". As a result, all related events of administrator showed in "Administrator GPO tracing".